Most beginners jump and then just wait for gravity to take over. But landing smooth is essential to make the most of your bike and your bones. It requires a lot of practice but it is very useful to avoid pinch flats when landing on sharp edges. Also, the smoother you are, the less pressure you need in the tyres without pinching flat on every jump, and you'll have more grip with low pressure. (see that in most landings the rear tyre goes nearly flat). How much of the impact you can damp depends a lot of your position in the air, and the reception surface. 2° As soon as the rear wheel touches, fold your knees smoothly while absorbing the impact progressively. Your weight must stay mainly above the rear wheel. 3° When the front wheel touches, you should start using your arms to resist and absorb the remaining of the impact by folding your arms in a push up towards the handlebars. It is important to target your landing zone with precision. If you drop off sideways, make sure you land aligned with the bike, else you can fall sideways upon impact. 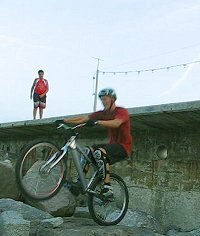 If the front wheel will land on a lower point than the rear wheel, then you should try to absorb all the impact on the rear wheel with as much balance as possible on the rear, and then lower the front wheel as progressively as possible to its target while you keep your bum above the rear wheel. 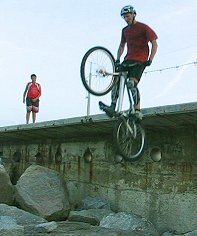 Else, with too much weight going forward during landing, you'll end up over the bars, or if you can resist the impact, your front tyre will pinch flat against the rim. If the front wheel has to land on a higher point than the rear wheel, then try to keep some weight over the bars, so that you can damp the impact with both the arms and legs at the same time. This will also prevent you from falling backward (because the bike is already inclinated). If you land horizontally, then it depends of the height you jump. From high, try to land on the rear first and then finish by touching the front wheel and absorbing the rest of the impact with your arms. 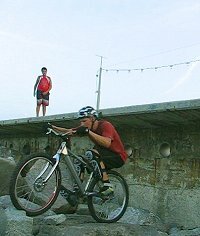 From a small jump, you can land both wheels at once and fold the knees and arms at the same rate to end up well stabilized. Check out the physics of the landing process, that may help you understand what you want to achieve. In all three cases, you should extend both your legs and arms as much as you can while in the air, before touching ground, so that you can fold more and have extra margin to absorb the impact. Also, before dropping off or jumping, try to be as low as possible on the bike (folded) so that when you extend in the air, you make the drop less high. Never land directly on the front wheel unless you know what you are doing. Also check out the Crash Speed Calculator and more explanations in the physics lecture.